This is the Alpha version of BuildCraft for Core Engine. 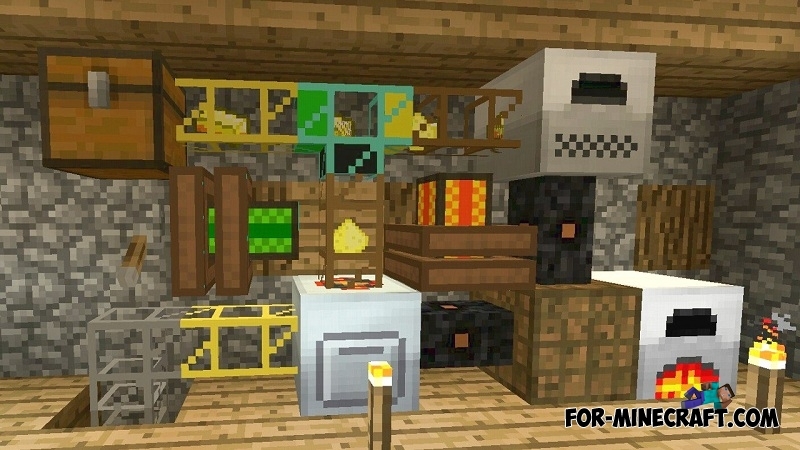 The BuildCraft mod adds only the most basic elements to Minecraft PE, but it is compatible with Industrial Craft and allows you to automate most of the production. All the necessary mods and apps you can download from our site. 1. There is Energy (MJ) which is so far only used for engines and wooden pipes. 1 MJ = 2.5 Eu (Industrial Craft Energy). 2. There are all transport pipes from BuildCraft PC with full porting of the mechanics of their work. a) Wood pipe. It pulls one or more objects from the connected containers when power is applied. b) Cobblestone, stone and sandstone pipes. These three types of transport pipes are not connected together. The movement of objects inside them slows down with time. c) Gold pipe. This is an accelerator pipe, it increases the accelerating effect when giving a red stone signal. d) Iron pipe. It directs objects in the specified direction which can be changed with a wrench. e) Emerald pipe. This is an advanced version of a wood one, it can filter objects. f) Diamond pipe. It sorts objects according to the direction. 3. There are engines with unique mechanics of heating and power generation. This is a global update adding liquids and many new items to work with it. Added cistern. Keeps 16 buckets of one liquid. Added water pump. Pumps the bucket of liquid from under itself. Added Buildcraft API! Now you can create your pipes and engines using BC API modules. All liquid pipes are activated. The content is very unstable and there are many errors. Please indicate the errors found in the comments. They turn on when a red stone signal is applied and heat up during operation. The engines can be turned with a wrench. The more the engine is heated, the faster the piston moves. Each push of the piston generates an energy pulse MJ that is transmitted to the consumer or the next connected engine along with the generated heat. Thus, the more the engine is heated, the more energy it generates. The piston accelerates and can not stop instantly, be prepared for the fact that it can make a few more moves after the engine is turned off if the piston moved fast enough. 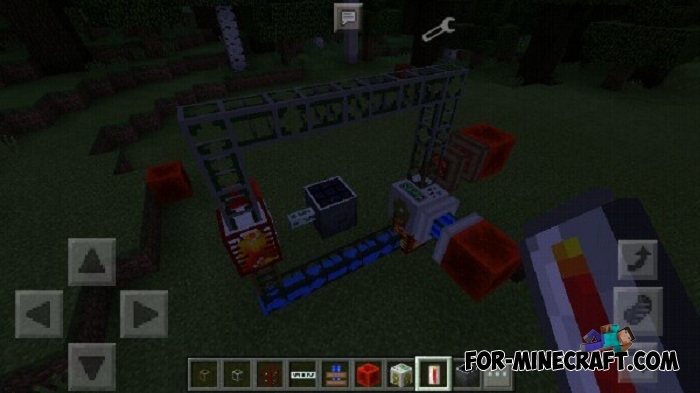 a) Redstone engine. It does not use any fuel and generates 1 MJ per thrust. This is enough to work a wooden pipe. It is highly accelerated at high temperature. b) Stirling's engine. It uses solid fuel for work, produces a good amount of energy but it stops and cools down for a short time with overheating. c) Internal combustion engine. It uses lava for work (in future versions it will also be oil, gasoline and biomass), produces a lot of energy, stops for a long time with overheating. d) Electrical engine. It converts Eu into MJ in a ratio of 5 to 2. It does not overheat and does not increase production with heating. 4. Unlike the Factorization mod for MCPE (download here), BuildCraft can support huge (more than 128) number of items in pipes without a noticeable drop in performance due to Core Engine and its own optimization in Minecraft PE. How to install the BuildCraft mod? 1. You need Core Engine 1.2 for stability. You can download it here - Core Engine. 2. Download the mod and move the Buildcraft folder here: games/com.mojang/mods. 4. Run Blocklauncher and wait for the restart. And what version of MCPE is supported? java.lang.Exception: The addon "IC Render" (com.industrialcore.render) is not compatible with Minecraft PE 1.5.0.14. There is some thing wrong with the item transport pipes! I used the wooden pipe to transport the item from the mecerator to the electric funace, it going very smoothy but when i placed the cobblestone pipe to the other electric funace (The wooden and cobblestone pipe didn't connect together) then the items pop up on top of the cobblestone pipe (the items from the mecerator that need to be transported to the other electric funace)! And the items transported from the electric funace back to the mecerator! Pls fix it ib the next update!